Using a light value and a blue hue, start at the top of the page and work down, adding colors for interest where the shapes in the reference images dictate. 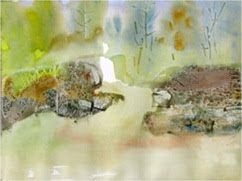 When you come to the rock areas, add lots of color, and while the color is still wet, add a piece of wax paper on top. Let dry. 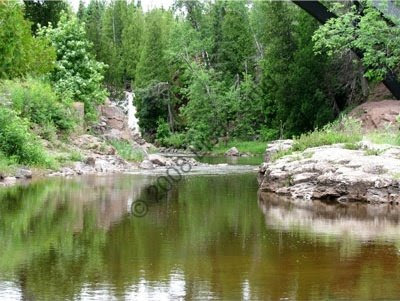 The reflections for this painting are going to be mainly green, because it will be reflecting what is above it. 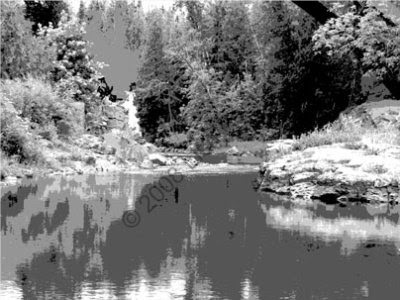 Using mid-range values, start to define the tree shapes in the background. Don't cover up all of the previous washes - let some of them come through. Pick out some rock shapes where you like the texture on them. Define them by putting a dark value behind the shape and softening the edge. 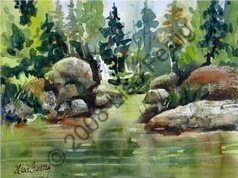 Drop in some of the rock colors in the reflections with a vertical stroke, then with a large, flat brush that is damp, drag the brush horizontally. 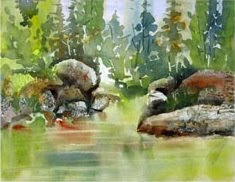 Use the tip of the brush like a thirsting brush, dragging some horizontal lines to show movement in the water. The final step in the painting will be using our darkest darks. Refer to your value study to see these shapes. Where your center of interest is your darkest and lightest light should meet. Use your darkest dark as an accessory in the painting, adding it sparingly.